You may have noticed that I've added a few more pages to the site lately. I have started compiling lists of different services readers of this blog could be interested in. I started with a list of tailors based on the British isles and I've added a list of online made-to-measure services. This is a work in progress and other pages will be added in the coming weeks. I will get back to this directory I'm trying to create in later posts, but following on from this work I will occasionally do a short presentation of one these tailors or companies. 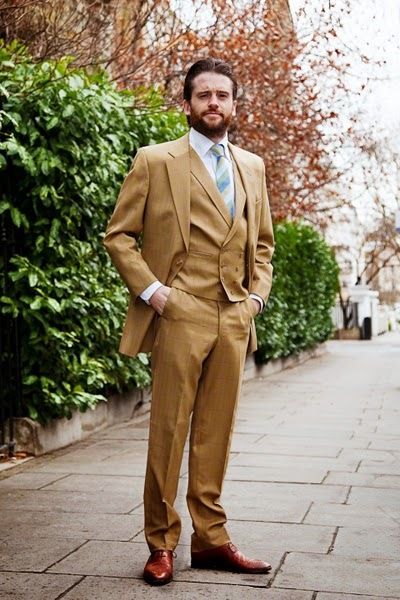 The first one out are the London based tailors Henry Herbert. Henry Herbert tailors are found on 9-10 Savile Row and are tailoring bespoke garments for their customers in accordance with the long tradition of this honourable London road. Deciding to visit one of the tailoring houses on Savile Row can be quite intimidating, something I touched upon in this previous article, but as one of the latest additions on Savile Row Henry Herbert is trying change this. They are lowering the threshold for getting high quality bespoke garments. 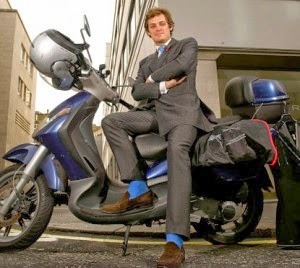 On their customised Vespas they travel around the greater London area to bring their services directly to the customers. With their Vespas equipped with measuring tapes, fabrics, chalk and pins they have all they need to make you a fully bespoke garment, without you even having to leave your home. They do, of course, also meet customers on their premises on Savile Row and on 156-158 Gray's Inn Road. They also regularly travel to New York as long as they have enough bookings. 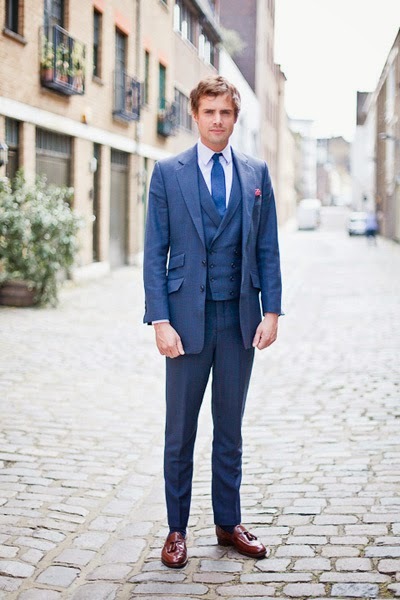 "Henry Herbert Tailors handcraft the finest bespoke suits, shirts and other garments. True to the highest standards of traditional Savile Row tailoring, all our suits and shirts are crafted in England using only the best fabrics we can source from mills in England and Scotland. It was set up by me, Charlie Baker-Collingwood (see picture below). Customers are welcome to visit us or we are happy to meet clients, wherever and whenever is good for them with our custom built Vespa’s. We are a small firm and we work hard for our customers. A common question I am often asked is “where were you trained?” Our tailors have a rich history of tailoring. I myself, apart from being a fully qualified motorcyclist, am also a qualified tailor too. I learned jacket making at Morley College (London), Trouser & Waistcoat making at Central St Martin’s and both shirtmaking and sewing skills at Westminster college. But just who is Henry Herbert? Henry Herbert was once master of the royal wardrobe to both King Charles I and King Charles II and the name was resurrected by me, Charlie Baker-Collingwood, in order to continue the tradition of fine English tailoring, at affordable prices. 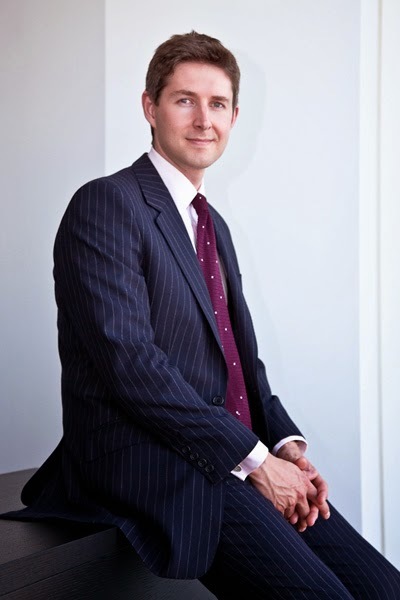 As bespoke suit tailors, Henry Herbert is proud to support the “Pick Your Cotton Carefully” campaign as well as other industry campaigns to ensure high ethical standards." Henry Herbert will create anything you want but they are also more than happy to give you qualified advice if you're not quite sure of what you want or need. As well as suits and shirts, Henry Herbert will make you morning suits, dinner suits, shooting suits, overcoats or whatever other garment you desire. Below are pictures of some of their creations. Single breasted, charcoal grey suit. Photo: Taken from the Henry Herbert website. A classic chalk stripe suit. 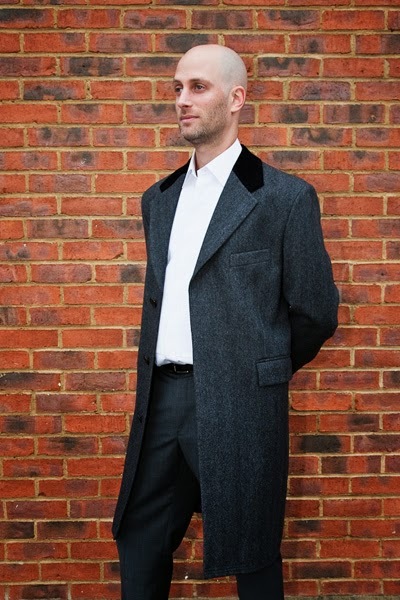 A wool overcoat with a velvet collar.